Cameroon finally arrived in Brazil for the World Cup on Monday after a dispute over bonus payments that delayed their journey for almost a day. 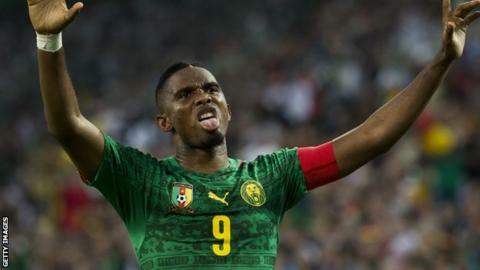 The squad, including former Chelsea striker Samuel Eto'o, had refused to fly to South America on Sunday morning. But they eventually agreed a financial package with the nation's football federation after an emergency meeting. The squad left from Yaounde at 06:00 on Monday, more than 20 hours later than had been scheduled. After agreeing an end to the row, Cameroon Football Federation president Joseph Owona said: "Everything has been resolved. "We have opted for transparency. There is no problem and I think the team needs to be mobilised for all to look in one direction."